A new edition of Boy Scout Requirements ( #33216 - SKU#619576) was released in February, 2014. It contains changes to the Eagle Scout rank and the requirements for 5 new merit badges. Of those 5 badges, 3 were released in 2013, 1 will replace an older badge which is being discontinued, and 1 is just a change in name and some minor requirements changes. The book also contains changes to the requirements for 31 other merit badges, including one badge not identified in the list of changes. Furthermore, it contains the requirements for a new "Special Opportunity" badge, an existing award that was not in previous editions, and a change to one set of awards, as listed below. Finally, the "Merit Badge Library" listing on the inside back cover, lists over 40 merit badge pamphlets with revision dates of 2013 or 2014, and a few with earlier revision dates which are after those listed in the 2013 edition. Some of those may contain further changes when they are issued. If so, we will identify them at that time. Minor changes to the Star and Life ranks, caused by the changes to the requirements for Eagle Scout, which should have been included ,were inadvertently omitted from the booklet. In addition, changes to one merit badge (Personal Fitness) were made in 2013, but were also not included in the booklet. Of the merit badges with changes that are in the booklet, 14 have changes which were previously announced at various times in 2013. In addition to the new merit badges listed below, BSA has announced plans to release a few more in the coming years, including Animation, Signs Signals and Codes, Exploring, Multi-Media, Computer Aided Design, and Advanced Computing. *During 2014, a Scout may continue—or begin work—using the old Cooking or Computers merit badge requirements and the old pamphlets. Otherwise, he may switch to—or begin work—using the new requirements as stated in the 2014 Boy Scout Requirements book for Cooking or Digital Technology (which replaces Computers) and the new merit badge pamphlets. If a Scout chooses to use the old merit badge requirements and pamphlets, he may continue using them until he has completed the badges. See Guide to Advancement topic 7.0.4.3. Merit badges that, during 2013, had changes announced or published in new merit badge pamphlets after publication of the 2013 Boy Scout Requirements booklet. Merit badges with changes to their requirements first announced in the 2014 Boy Scout Requirements booklet. * Choose any of the 15 17 required merit badges in the 12 13 categories to fulfill requirement 3. Lone Scout. Leadership responsibility in his school, religious organization, club, or elsewhere in his community. * You must choose only one merit badge listed in items (g) and (j) (h), (i), and (k). If you have earned more than one of the badges listed in items (g) and (j) (h), (i), and (k), choose one and list the remaining badges to make your total of 21. Note: The 2014 Boy Scout Requirements Booklet has a typo in the footnote. The second change shown above was inadvertently omitted. This is a NEW Merit Badge that was introduced on March 6, 2013, the official "Earn Date", when Scouts had authorization to begin earning the badge. Play the game with one rule or objective change, observing how the players' actions and emotional experiences are affected by the rule change. Repeat this process with two other changes. With your parent's permission and your counselor's approval, visit with a professional in the game development industry and ask him or her about his or her job and how it fits into the overall development process. Alternately, meet with a professional in game development education and discuss the skills he or she emphasizes in the classroom. This is a NEW Merit Badge that was introduced at the National Jamboree on July 15, 2013, the official "Earn Date", when Scouts had authorization to begin earning the badge. With your counselor's approval, choose a sample program. Then, as a minimum, modify the code or add a function or subprogram to it. Debug and demonstrate the modified program to your counselor. The Programming merit badge website, http://www.boyslife.org/programming, has a number of sample programs that you could use for requirement 5a. However, you have the option of finding a program on your own. It's a good idea to seek your merit badge counselor's guidance. With your counselor's approval, choose a second programming language and development environment, different from those used for requirement 5a and in a different industry from 5a. Then write, debug, and demonstrate a functioning program to your counselor, using that language and environment. With your counselor's approval, choose a third programming language and development environment, different from those used for requirements 5a and 5b and in a different industry from 5a or 5b. Then write, debug, and demonstrate a functioning program to your counselor, using that language and environment. This is a NEW Merit Badge that was introduced at the National Jamboree on July 15, 2013, the official "Earn Date", when Scouts had authorization to begin earning the badge. In October, 2013, Requirement 2, WATER, A was revised as shown below. Develop and implement a plan that attempts to reduce your family's water usage. Examine your family's water bills reflecting usage for three months (past or current).As a family, discuss water usage. To aid in your discussion, if past water bills are available, you may choose to examine a few. As a family, choose three ways to help reduce consumption. Implement those ideas for one month. Share what you learn with your counselor, and tell how your plan affected your family's water usage. Since water bills are not always accessible, any Scout who wishes to, may use the following as an alternative to 2A above. This alternative will become the official requirement 2A upon the next reprinting of the Sustainability merit badge pamphlet. This is a NEW merit badge. Although the requirements were included in the 2014 Boy Scout Requirements booklet, Scouts could not earn the badge until the official "Earn Date" which was April 16, 2014. The badge is a replacement for the Computers merit badge, which will be discontinued. However, since it is a NEW badge, with substantially different requirements, Scouts may earn Digital Technology, even if they have already earned Computers. During 2014, a Scout may continue—or begin work—using the old Computers merit badge requirements and the old pamphlet. Otherwise, he may switch to—or begin work—using the new requirements as stated in the 2014 Boy Scout Requirements book for Digital Technology and the new merit badge pamphlet. If a Scout chooses to use the old merit badge requirements and pamphlet, he may continue using them until he has completed the badge. See Guide to Advancement topic 7.0.4.3. Give a brief history of the changes in digital technology over time. Discuss with your counselor how digital technology in your lifetime compares with that of your parent's, grandparent's, or other adult's lifetime. Explain what a computer network is and describe the network's purpose. Explain what a program or software application or "app" is and how it is created. Use a Web browser to connect to an HTTPS (secure) website (with your parent's permission). Explain to your counselor how to tell whether the site's security certificate can be trusted, and what it means to use this kind of connection. Using a word processor, write a draft letter to the parents of your troop's Scouts, inviting them to a troop event. Along with the release of the Digital Technology Merit Badge, this badge is scheduled to be discontinued on January 1, 2015. Since Digital Technology will be a NEW badge, with substantially different requirements, Scouts may earn Digital Technology, even if they have already earned Computers. The Cinematography Merit Badge was renamed "Moviemaking" in October, 2013. Old requirement 1a became 1 and 1b was dropped, and minor changes were made to requirements 2a and 4, all as shown below. Other than the minor wording changes to the requirements, this is strictly a change in name. The same badge will be used. a. Discuss and demonstrate the proper elements of a good motion picture. In your discussion, include visual storytelling, rhythm, the 180-axis rule, camera movement, framing and composition of camera shots, and lens selection. b. Discuss the Cinematographer's role in the moviemaking process. The requirements were rewritten, and the badge was added to the list of badges required for the rank of Eagle Scout. During 2014, a Scout may continue—or begin work—using the old Cooking merit badge requirements (Click here) and the old pamphlet. Otherwise, he may switch to—or begin work—using the new requirements as stated in the 2014 Boy Scout Requirements book for Cooking (below), and the new merit badge pamphlet. If a Scout chooses to use the old merit badge requirements and pamphlet, he may continue using them until he has completed the badge. See Guide to Advancement topic 7.0.4.3. The new requirements are shown below. Note: The meals prepared for Cooking merit badge requirements 5, 6, and 7 will count only toward fulfilling those requirements and will not count toward rank advancement. Meals prepared for rank advancement may not count toward the Cooking merit badge. You must not repeat any menus for meals actually prepared or cooked in requirements 5, 6, and 7. Explain to your counselor the most likely hazards you may encounter while participating in cooking activities and what you should do to anticipate, help prevent, mitigate, and respond to these hazards. Discuss with your counselor food allergies, food intolerance, food-related diseases, and your awareness of these concerns. Refer to "How to Read a Food Label" in the Cooking merit badge pamphlet, and name ingredients that help the consumer identify the following allergens: peanuts, tree nuts, milk, eggs, wheat, soy, and shellfish. Discuss EACH of the following cooking methods. For each one, describe the equipment needed and name at least one food that can be cooked using that method: baking, boiling, pan frying, simmering, steaming, microwaving, and grilling. Discuss how the Outdoor Code and no-trace principles pertain to cooking in the outdoors. Explain how you kept perishable foods safe and free from cross-contamination. In the outdoors, cook two of the meals you planned in requirement 6 using either a lightweight stove or a low-impact fire. Use a different cooking method for each meal. ** The same fireplace may be used for both meals. Serve this meal to your patrol or a group of youth. After each meal, have those you served evaluate the meal on presentation and taste, and then evaluate your own meal. Discuss what you learned with your counselor, including any adjustments that could have improved or enhanced your meals. Tell how better planning and preparation help ensure successful outdoor cooking. For each meal prepared in requirement 7c, use safe food-handling practices. Clean up equipment, utensils, and the site thoroughly after each meal. Properly dispose of dishwater, and pack out all garbage. After each meal, have those you served evaluate the meal on presentation and taste, then evaluate your own meal. Discuss what you learned with your counselor, including any adjustments that could have improved or enhanced your meals. Tell how better planning and preparation help ensure successful trail hiking or backpacking meals. Find out about three career opportunities in cooking. Select one and find out the education, training, and experience required for this profession. Discuss this with your counselor, and explain why this profession might interest you. *The meals for requirement 5 may be prepared on different days, and they need not be prepared consecutively. The requirement calls for Scouts to plan, prepare, and serve one breakfast, one lunch, and one dinner to at least one adult; those served need not be the same for all meals. **Where local regulations do not allow you to build a fire, the counselor may adjust the requirement to meet the law. The meals in requirements 6 and 7 may be prepared for different trips and need not be prepared consecutively. Scouts working on this badge in summer camp should take into consideration foods that can be obtained at the camp commissary. These changes took effect on July 15, 2013, when they were released at the National Jamboree. Describe your state's traffic laws for bicycles. Compare them with motor-vehicle laws. 7. Describe your state's traffic laws for bicycles. Compare them with motor-vehicle laws. Know the bicycle-safety guidelines. f. Lope (canter) the horse in a half-circle not more than 30 feet in radius. Identify and demonstrate to your counselor the safe use of leatherworking tools. Show correct procedures for handling leathercraft dyes, cements, and finishes. Know first aid for cuts, internal poisoning, and skin irritation. A new merit badge pamphlet was released in 2013, with revised requirements. The changes, however, were inadvertently omitted from the 2014 Boy Scout Requirements booklet. The wording of requirement 7 was changed when the new Safety merit badge pamphlet was released. The revision is as shown below. A new option c was added to requirement 4 in September, 2013. The revision is shown below. Demonstrate the knowledge, skill skills, and attitude necessary to safely shoot a muzzleloading shotgun on a range, including range procedures. Explain what a misfire, hangfire, and squibfire are, and explain the procedures to follow in response to each. Identify the causes of a muzzleloading shotgun's failing failure to fire and explain or demonstrate proper correction preventive procedures. A footnote was added to requirement 9a as shown below. Requirement 3c was revised as shown below. Research your family's history. Find out how various events and situations in American history affected your family. If your family immigrated to America, tell the reasons why. Share what you find with your counselor. Tell why your family came to America. Requirements 1, 2, 7a, and 7b were revised. The revisions are shown below. Changes were made to requirements 1e, 2c, and 4b. Requirement 2e was deleted, causing 2f and 2g to be renumbered as 2e and 2f. The revisions are shown below. There is a typo in requirement 2f in the 2014 Boy Scout Requirements booklet. When the requirements were renumbered, they did not change the reference from 2f to 2e at the end of the requirement. Obtain and learn how to read an aeronautical chart. Measure a true course on the chart. Correct it for magnetic variation, compass deviation, and wind drift. Arrive at to determine a compass heading. On a map, mark a route for an imaginary airline trip to at least three different locations. Start from the commercial airport nearest your home. From timetables (obtained from agents or online from a computer, with your parent's permission), decide when you will get to and leave from all connecting points. Create an aviation flight plan and itinerary for each destination. f. Explain the purposes and functions of the various instruments found in a typical single-engine aircraft: attitude indicator, heading indicator, altimeter, airspeed indicator, turn and bank indicator, vertical speed indicator, compass, navigation (GPS and VOR) and communication radios, tachometer, oil pressure gauge, and oil temperature gauge. g. Create an original poster of an aircraft instrument panel. Include and identify the instruments and radios discussed in requirement 2f 2e. Visit a Federal Aviation Administration facility - a control tower, terminal radar control facility, air route traffic control center, flight service station, or Flight Standards District Office. (Phone directory listings are under U.S. Government Offices, Transportation Department, Federal Aviation Administration. Call in advance.) Report on the operation and your impressions of the facility. Minor changes were made to requirements 5 and 8. The revisions are shown below. Attend a public meeting (city council, school board, debate) approved by your counselor where several points of view are given on a single issue. Practice active listening skills and take careful notes of each point of view. Present Prepare an objective report that includes all points of view that were expressed, and share this with your counselor. A very minor change was made to requirement 2b as shown below. Compare the similarities and differences between composites and wood, aluminum, copper, and steel. Explain the physical, electrical, mechanical, corrosive, flammability, cost, and other such properties. For each of these raw materials, give one example for of how it can be shaped and used for a specific application. Changes were made to requirements 2, 3a, 3b, and 3d. The revisions are shown below. Talk to a Scout who has a disability and learn about his experiences taking part in Scouting activities and earning different merit badges. Discuss what you have learned with your counselor. Talk to an individual who has a disability and learn about this person's experiences and the activities in which this person likes to participate. Discuss what you have learned with your counselor. Learn about independent living aids such as service animals, canes, and augmentative communication devices such as teletypewriters (TTYs). Discuss with your counselor how people use such aids. Changes were made to requirement 8 as shown below. On Make a floor plan of a room in your home, make a wiring diagram of the lights, switches, and outlets for a room in your home. Show which fuse or circuit breaker protects each one. The requirements were completely rewritten. The revised requirements are shown below. Identify and interview an individual who has started a business. Learn about this person's educational background, early work experiences, where the idea for the business came from, and what was involved in starting the business. Find out how the entrepreneur raised the capital (money) to start the business, examples of successes and challenges faced, and how the business is currently doing (if applicable). Discuss with your counselor what you have learned. Identify your business's competitors, and describe their strengths and weaknesses. A change was made to requirement 9 as shown below. Note that there is a minor difference in requirement 4 between the 2014 Boy Scout Requirements booklet and the Fishing merit badge pamphlet. The word shown in this format appears only in the pamphlet. Requirement 4e was revised as shown below. Requirement 4b1 was revised as shown below. In the field, identify three species of wild animals mammals. A new requirement 3 was added. Old requirements 3-7 were renumbered as 4-8, and changes were made to requirements 4, and 8-Option 1-E3a. The revisions are shown below. 3. Explain how water, light, air, temperature, pollinators, and pests affect plants. Describe the nature and function of soil and explain its importance. Tell about the texture, structure, and composition of fertile soil. Tell how soil may be improved. 4. Tell how to propagate plants by seeds, roots, cuttings, tubers, and grafting. Grow a plant by ONE of these methods. 5. List by common name at least 10 native plants and 10 cultivated plants that grow near your home. List five invasive nonnative plants in your area and tell how they may be harmful. Tell how the spread of invasive plants may be avoided or controlled in ways that are not damaging to humans, wildlife, and the environment. 6. Name and tell about careers in agronomy, horticulture, and botany. Write a paragraph about a career in one of these fields that interests you. Collect, count, and label samples of each for display: perennial grasses, annual grasses, legumes, and broadleaf weeds. Indicate how each grass and legume is used. Tell the kind of Keep a log of the site where you found each sample and share it with your counselor. Changes were made to requirements 2b and 7b, as shown below. List and explain the various forms of public/mass transit using rail as the fixed guide path. Explain the meaning of three whistle horn signals. Minor changes were made to a number of requirements, and they were renumbered. The revisions are shown below. Show that you know first aid for and how to prevent injuries or illnesses that could occur while rowing, including cold and heat reactions, dehydration, contusions, lacerations, and blisters. 3. Before doing the following requirements, successfully complete the BSA swimmer test. Jump feet first into water over your head in depth. Level off and swim 75 yards in a strong manner using one or more of the following strokes: sidestroke, breaststroke, trudgen, or crawl; then swim 25 yards using an easy, resting backstroke. The 100 yards must be completed in one swim without stops and must include at least one sharp turn. After completing the swim, rest by floating. 4. Review and discuss Safety Afloat and demonstrate the proper fit and use of personal flotation devices (PFDs). Row in a straight line for a quarter mile 100 yards. Stop, make a pivot turn, and return to the starting point. Backwater in a straight line for 50 25 yards. Make a turn under way and return to the starting point. Tie the following mooring knots: - clove hitch, roundturn with two half hitches, bowline, Wellman's knot, and mooring hitch. In a fixed-seat rowboat, come alongside a dock pier and help a passenger into the boat. Pull away from the dock pier, change positions with your passenger, and scull in good form demonstrate sculling over the stern for 10 yards, including at least one 180-degree turn or side. Resume your rowing position, return alongside the pier, and help your passenger out of the boat. 7. Participate in a swamped boat drill, including righting and stabilizing the craft, reboarding in deep water, and making headway. Tell why you should stay with a swamped boat. 8. Alone in a rowboat, push off from the shore or a dock pier. Row 10 20 yards to a swimmer. While giving instructions to the swimmer, turn pivot the boat so that the swimmer can hold onto the stern. Tow him to shore. 9. Show or explain the proper use of anchors for rowboats. Types of crafts craft used in commercial, competitive, and recreational rowing. Four common boat building materials. Give some positive and negative points of each. Types of oarlocks used in competitive, and recreational rowing. Precautions regarding strong winds and heavy waves, and boat-handling procedures in rough water and windstorms. Requirement 5a was revised as shown below. Help your unit raise funds through sales either of merchandise or of tickets to a Scout show event. Requirement 5 was replaced and a footnote added, as shown below. Complete the training for ICS-100, Introduction to Incident Command System. Print out the certificate of completion and show it to your counselor. Discuss with your counselor how the ICS compares with Scouting's patrol method. The requirements were changed by adding a new requirement 1d, and revised wording to requirements 5a,5c, 6a, and 7. The revisions are shown below. Discuss with your counselor an unmanned a robotic space exploration mission and an early manned a historic crewed mission. Tell about each mission's major discoveries, its importance, and what we was learned from it about the planets, moons, or regions of space explored. Design an unmanned a robotic mission to another planet or moon that will return samples of its surface to Earth. Name the planet or moon your spacecraft will visit. Show how your design will cope with the conditions of the planet's or moon's environment. Old requirements 1, 2, and 4 were replaced by new requirements 1a - 1c. Old requirement 3 became requirement 2. Old requirements 5a-5k became requirements 3a-3c, 4a-4b, 5a-5b, 6, and 7a-7c. Old requirements 6a-6h became requirements 8a-8d and 9a-9d. Old requirement 7a-g became requirements 10a-g, and a new requirement 10h was added. Old requirement 8 became requirement 11. Old requirement 9 became requirement 12, the introduction was revised, and old requirement 9e was dropped. Old requirement 10a was replaced with requirements 13a and 13b, and 10b-10f became 13c-13g. 3. Before doing the following requirements, successfully complete the BSA swimmer test: Jump feetfirst into water over the head in depth. Level off and swim 75 yards in a strong manner using one or more of the following strokes: sidestroke, breaststroke, trudgen, or crawl; then swim 25 yards using an easy, resting backstroke. The 100 yards must be completed in one swim without stops and must include at least one sharp turn. After completing the swim, rest by floating. Demonstrate how to correctly size a paddle for a paddler in a sitting position and a kneeling position. Show how to properly fit and test a PFD of correct size. Using a single-blade paddle and paddling only on one side, demonstrate proper form and use of the forward stroke, backstroke, draw stroke, pushaway stroke, forward sweep, reverse or back sweep, and J-stroke, and rudder stroke. Repeat while paddling on the other side. While paddling on one side only, paddle a 50-yard course making at least one turn underway and one reverse of direction Repeat while paddling on the other side. Old requirements 1, 5, 6, 7, and 9 became new requirements 1b, 3, 5, 6, 7. From old requirement 3, Second Class requirement 8c, and First Class requirements 9b and 9c became new requirements 4a, 2, and 4b. Portions of old requirements 10a and 10b were merged and became new requirement 8. Old requirements 2, 4, 8, 10c, and 10d were deleted. New requirement 1a was added, along with a note to requirement 7. Minor editing changes were made to some requirements. Discuss the prevention of and treatment for of health concerns that could occur while swimming, including hypothermia, dehydration, sunburn, heat exhaustion, heatstroke, muscle cramps, hyperventilation, spinal injury, stings and bites, and cuts and scrapes. (9b) Before doing the following requirements, successfully complete the BSA swimmer test. Float faceup face up in a resting position for at least one minute. While wearing a properly fitted personal floatation device (PFD) U.S. Coast Guard–approved life jacket, demonstrate the HELP and huddle positions. Explain their purposes. Use the feetfirst feet first method of surface diving and bring an object up from the bottom. Describe the sport of scuba diving or snorkeling, and demonstrate your knowledge of BSA policies and procedures relating to that sport. 9. 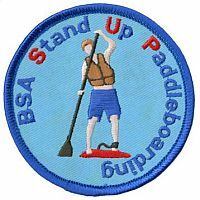 Following the guidelines set in the BSA Safe Swim Defense, in water at least 7 feet deep*, show a standing headfirst dive from a dock or pool deck. Show a long shallow dive, also from the dock or pool deck. Discuss with your counselor the incentives and obstacles for staying with the fitness program you created in requirement 10c. Explain the unique benefits that could be gained from this program, and discuss how personal health awareness and self discipline would relate to your own willingness and ability to pursue such a program. The following requirements for this new aquatics award were added to the booklet. The requirements for this certification were added to the booklet. The requirements, which are extensive, were completely revised in 2013. The requirements have not been reproduced here. Just follow the link (click on the image or title above) to see them. The information about these awards was changed by deletion of the Heroism Award, which may be discontinued, pending a final decision from the National Court of Honor. The information which was deleted is shown below. Has demonstrated heroism and skill in averting serious injury or saving or attempting to save a life at minimum risk to self. A few minor changes were made to the contact information for some of the emblems. Rather than list the changes here, see the Religious Emblems listing for Boy Scouts (and Varsity Scouts, Venturers, and Sea Scouts) on this site. Just follow the link (click on the image or title above) to see them. so long as the source is acknowledged, but copying the information to another web site is NOT authorized.